Throw Me a Bone is a 4-player minigame in Mario Party 6. Its name comes from the expression "throw me a bone", which is a plaintive request for someone to go easy on or aid the speaker. There are only aesthetic changes between the daytime and the nighttime. When this minigame is played in Decathalon Park, the Chain Chomp that was watching the events follows the four players. There is a Miracle Book page featuring this minigame, called "Fetch". The camera starts out with a front view of the player on the Chain Chomp. It then rotates around to behind the player as the screen splits into four sections. Players attempt to toss bones to make the Chain Chomps they ride upon move forward, toward the goal. A purple arrow moving left and right appears in front of the player before they toss a bone. Pressing stops the arrow. They then toss a bone in that direction, which the Chain Chomp chases the bone. If the Chain Chomp bumps into a column, the Chain Chomp and player are temporarily stunned. The first one to cross the finish line wins. This minigame appears as the eighth minigame in Decathalon Park. Here, the player's objective is to get to the goal as fast as possible to earn as much points as possible, up to a maximum of 1,000. The default record for this minigame in Decathalon Park is 60"00. There are two possible endings. 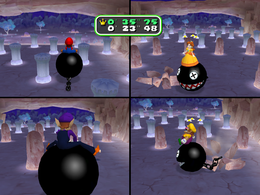 The first involves the winner performing their victory animation with the Chain Chomp behind them. 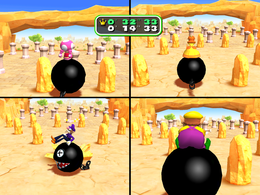 The second involves the winner performing the animation as a bone is thrown across the screen from off screen; a Chain Chomp then races after it. Rules – "Throw bones to coax the Chain-Chomp around obstacles and to the goal! Whoever crosses the goal first wins!" Advice – "The Chain-Chomp will chase after bones, so try to throw them into open spaces to avoid obstacles." This page was last edited on March 27, 2019, at 00:23.